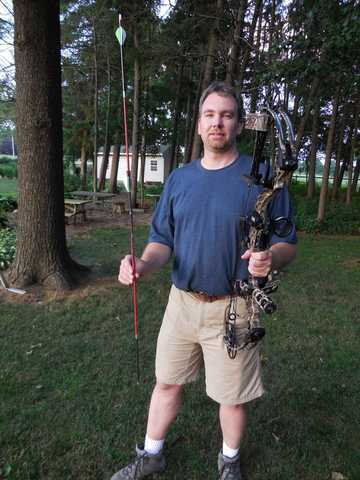 Summer of 2014 started with updating some gear, hiking and shooting my new bow. After the first day of practice I was lucky to get my first "robin hood" needless to say that was the start of my good luck for the year. October 1 finally arrived with a 30 minute drive to Harrisburg International Airport. 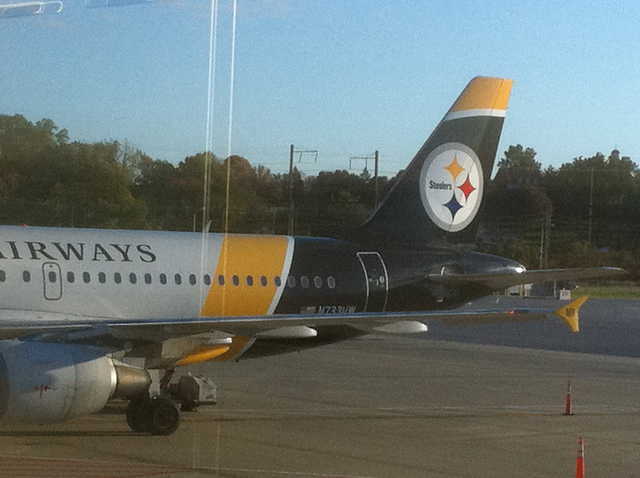 Being a steelers fan I thought it was cool to see the Pittsburgh Steelers plane at the airport. After a long day of flying, I arrived in Bozeman Montana around 11:30 pm to find Steve K. Lenny M. and Roy Reiff wating for me in the airport lobby. The next day we went to town and got our tags, shot our bows and got ready for the days hunt. 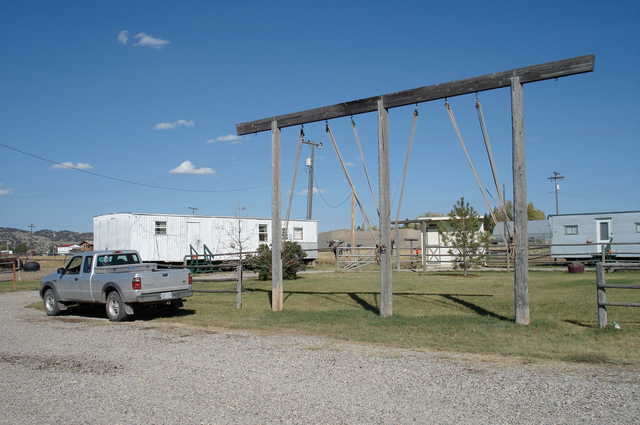 A picture of camp with the poles waiting for some Elk. 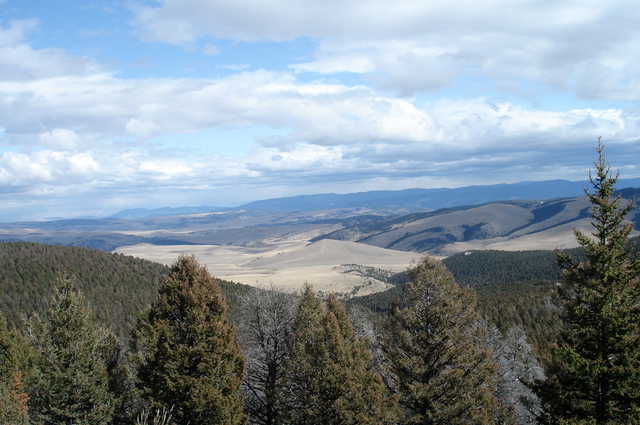 Roy and I did some glassing and took some pictures, even the guides take pictures of the beautiful views. 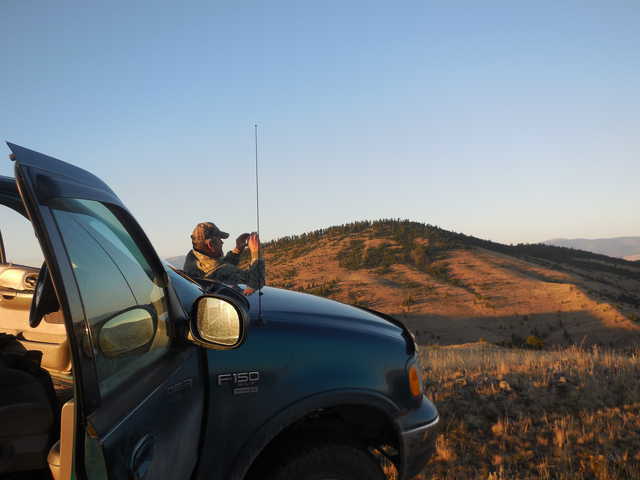 We saw some elk and made a game plan for the days ahead. 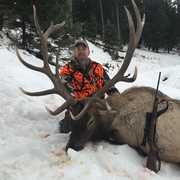 On the 4th day of our hunt we spotted a herd of Elk with a few good bulls in it, they were headed for the timber. Roy and I gathered our gear and headed in after them. We spotted some cows beaded in the timber and we settled in. After a few hours of Roy calling we finally had a bull coming our way, It wasn't long till we saw antlers coming through the trees and he was headed our way! When the bull passed behind a tree I pulled back my bow, he walked straight at us till he was at 11 yards and quartering to me. I settled the pin on the vitals and squeezed off the shot. The bull turned and ran, and I could see I had a good shot. We gave the bull some time as Roy and I reflected on what just happened. Walking up to the bull I could see a nice 6x7 bull. We took some pictures and got to work, expecting a long night ahead of us till we got him back to camp. Roy did a great job enticing the bull to come in with the bugle tube, he was as excited as I was and deserved a picture with my bull. 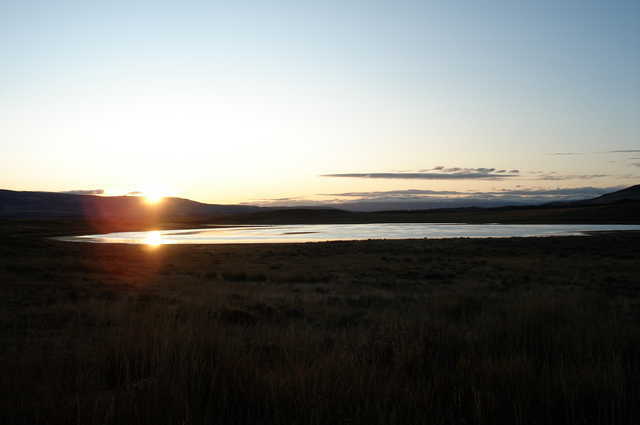 We saw some great sunrises the next few mornings as we turned our attention to some Mule Deer. 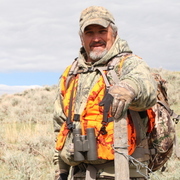 Roy put me in a ground blind at a water tank one morning as he went to a high point to glass. I saw a few mulie does around 9am and then a few bucks followed, 2 of them were "shooters". They were about 250 yards away feeding and finally bedded a hour later. We planned to put a stalk on the buck, but when Roy drove in to get me the deer got restless and started moving around. Roy backed out to see what they were going to do. Not long after Roy left the deer started walking my way. I scrambled to get ready, as they were closing the distance to the blind. 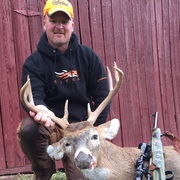 A few doe came in first to about 20 yards and the buck followed, as the buck turned broadside I shot and deer went everywhere! The buck slowly walked over the hill as Roy came to pick me up. We found him expired over the hill and had my first mule deer with the bow. We loaded the deer in the truck and headed back to the lodge to skin out and put in the cooler. 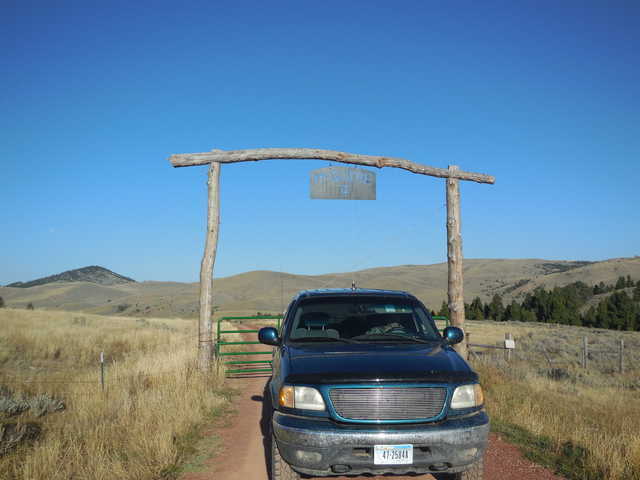 The ranch gates in Montana are awesome. With my hunt over I reflect on the fun and excitement I had over the last week. 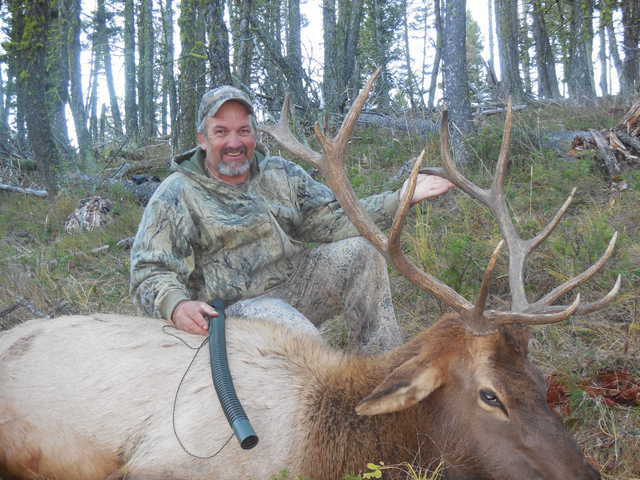 I will never forget the day I shot my elk, the most exciting day hunting ever. 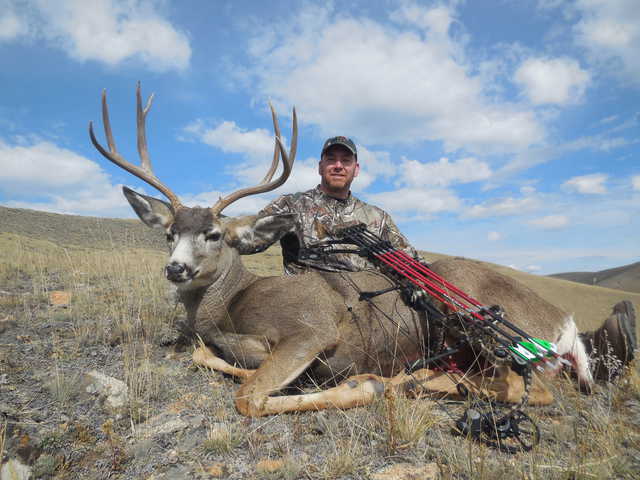 and the Mule Deer hunt happen so fast, It proves that it can happen at any time. 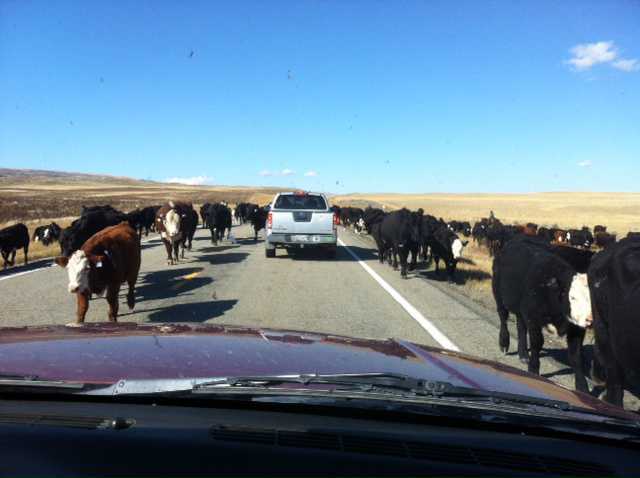 As we head to to the airport we come upon a cattle drive... only in Montana. I had a great week hunting with Rawhide, Roy is a great guide and we had a lot of fun. 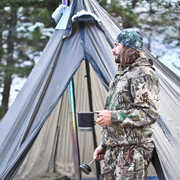 The other guides and hunters were great and we had a enjoyable time in camp. 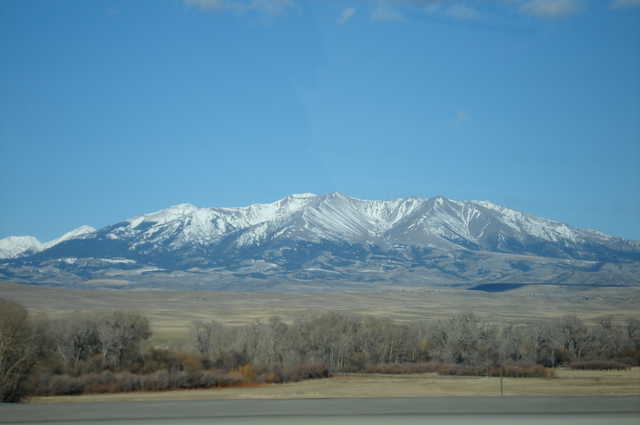 I plan to hunt with Rawhide again in 2015 and look forward to to the great experiences I will take home. Yes Hank We had a great week! Holy smokes! 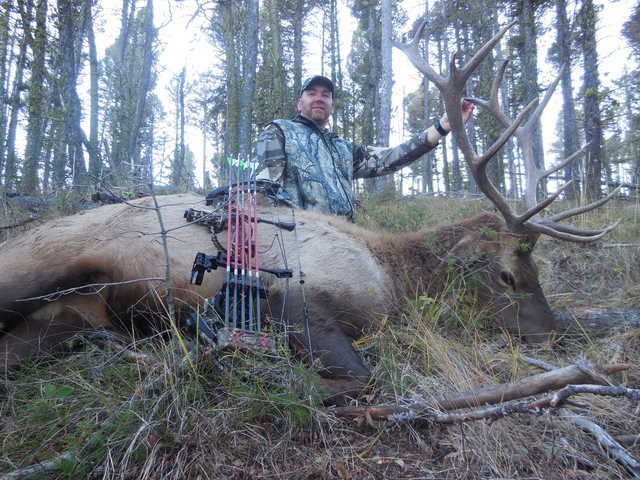 That's one heck of an elk AND a mule deer in the same hunt with a bow! Are you kidding me?